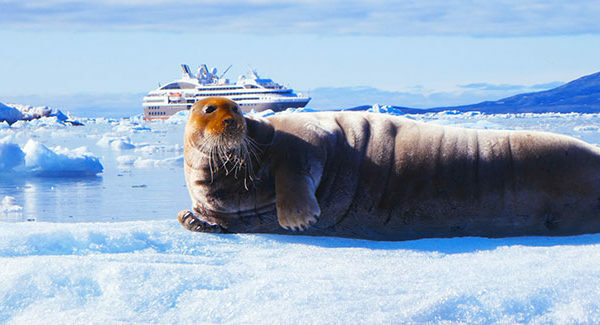 Voyage through the otherworldly Arctic Circle on this unique eleven-day itinerary featuring an extraordinary seven-night cruise on the five-star, eco-friendly L’Austral, exclusively chartered for your expedition. Visit during the region’s most enchanting season, when shimmering ice basks in the midnight sun’s ceaseless glow. Sail the shores of secluded Spitsbergen, the jewel of Norway’s rarely visited Svalbard archipelago; see glaciers crease and calve in luminous blues; and look for the enigmatic polar bear, who reigns as king. Survey an ethereal topography of red sandstone mountain ranges, lush green tundra, and awe-inspiring ice formations, and enjoy Zodiac excursions led by a team of expert naturalists in diverse, serene terrains, where remarkable wildlife-including whales, walruses, seals, Svalbard reindeer, Arctic foxes, northern fulmars, and Arctic terns-roam freely. Complimentary Wi-Fi and alcoholic and nonalcoholic beverages are available throughout the cruise. The program’s flight to Longyearbyen originates in Paris; spend one night in a downtown Paris hotel before the flight and one night in the deluxe Hilton Paris Charles de Gaulle Airport Hotel upon return from the Arctic. Paris pre-program option also offered. Download a brochure about the trip here.